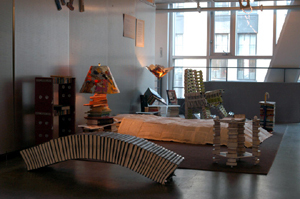 Our exhibition, A Bibliophiles Bedroom, was on display at the Boston Public Library's Defferrari Hall for the months of April and June 2004, and before that at MIT's Rotch Library for the months of February and March 2004. You can now find a few pieces from the exhibition at MIT CSAIL's William R. Hewlett Reading Room. All other pieces are now with their owners. Click a title below to view one of the pieces.